For all its cost and vulnerabilities, the aircraft carrier and its strike group are the best option for the threats facing the U.S., according to a Hudson Institute study released on Monday. The report, co-authored by three military strategy experts, addresses a question the Defense Department has periodically asked itself for decades: Do we really need aircraft carriers, and if so, how many? “The most compelling case for continuing to build and operate carriers is their value in high-end warfare against a peer competitor,” said one author, a retired destroyer skipper. In other words: In a potential future conflict with China, the carrier is the only platform that can get the job done, the authors conclude. 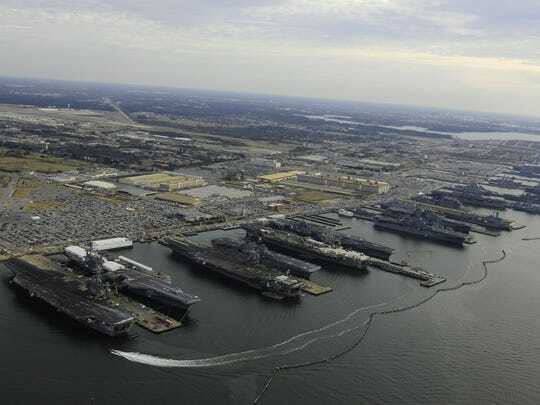 “I think what we have done with this report is to lay out in pretty gritty detail what is involved in that and why the aircraft carrier has a role in that,” said retired Cmdr. Bryan McGrath, deputy director of the institute’s Center for American Seapower, who worked with director Seth Cropsey and Alios Consulting Group principal Tim Walton. The Hudson Institute is an independent research organization that promotes U.S. maritime capabilities. The idea for the study, McGrath said, came from a debate early this year at the Naval Academy between himself and retired Capt. Jerry Hendrix, a senior fellow at the Center for a New American Security, over the usefulness of continuing to build large, nuclear-powered aircraft carriers. For one, McGrath said, they’re expensive at $12.9 billion each. And second, China’s development of anti-access/area denial capabilities could limit a carrier’s ability to pull in close and start launching aircraft. Hendrix argued that having to put more space between the carrier and an enemy makes sea-based airstrikes less viable. Critics have said that land-based Air Force assets could do the job for less money in that situation. In researching the report, the authors consulted with Navy officials, industry and think tanks, including Military Sea Lift Command, the Office of the Director of Air Warfare under the chief of naval personnel, Lockheed Martin and Boeing. Huntington Ingalls, a shipbuilding company, contributed 20 percent of the study’s budget, but had no editorial oversight, McGrath said. “Where we had some disagreement — and we ultimately held a steady course on it — there was a sense raised that we spent too much time talking about the high-end fight and we didn’t spend any time talking about what the aircraft carrier spends most of its time doing,” he said. That is, patrolling waterways and serving as a deterrent to possible conflicts. But the presence piece doesn’t take into account the fight the Navy is preparing for now, and the carrier’s ability to deal with it despite its vulnerabilities. In the report, McGrath and his co-authors argue that any threat against a carrier would also be a threat against nearby Air Force bases, forcing squadrons to evacuate air fields and stage from bases in Guam, Alaska or Australia. “The key takeaway is that there are high-end, China-war-driven things that the carrier will do — and that only the carrier will likely do, in such a conflict — because of our view that land-based tactical air support will be out,” he said. To further make their point, the authors included a comprehensive history of the carrier, the air wing and the strike group from World War II to today. There were two reasons for doing this, McGrath said: to show the evolution of the carrier’s capabilities and its role in a joint strategy, and to drive home the point that the Defense Department has debated the use of carriers on a regular basis throughout their history, depending on waxing and waning popular opinion. Those waning opinions usually rise when budgets are tight, he said. “When you look around the portfolio and see something that costs $12.9 billion, it naturally suggests itself as a target,” he said. And critics are right to say that spending billions of dollars on a platform that spends most of its operational time floating off coasts for deterrence isn’t the best use of the carrier’s abilities, he added. One way to reduce costs would be to get into serial production of Ford-class carriers — the flagship is on its way to the fleet next year and Kennedy expected to be delivered in 2020 or soon thereafter — because classes of ships become cheaper as more are built. And to address vulnerabilities, he said, the air wing could use an overhaul. “The capabilities of the present air wing are perfect for a post-Cold War era, where you sit off some Third World country and pound them into submission, but it’s not enough,” McGrath said. More stealthy strike would help. Also, for example, would the former S-3 Viking, an anti-submarine warfare jet that was later used as an organic, carrier-based tanker for air-to-air refueling. All of these things will still cost money, but McGrath’s answer to budget critics is concise.